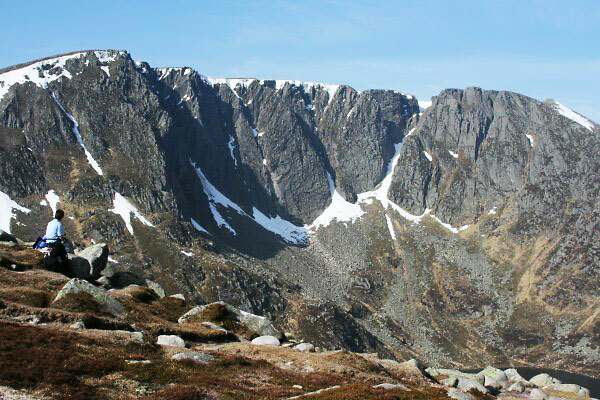 The mountain Lochnagar with its three peaks curves around a massive corrie with impressive cliffs enclosing the loch of the same name, Lochnagar. Cac Carn Beag the highest summit lies to the NW, Cuidhe Crom (1083m) to the SE and Meikle Pap (980m) to the NE (giving the classic view of the cliffs). 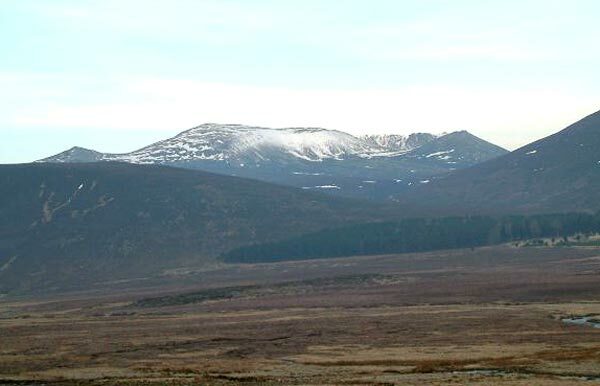 Lochnagar seen from Glen Muick. A cold winters day in february 2008, looking towards the cairn at the top of Lochnagar. 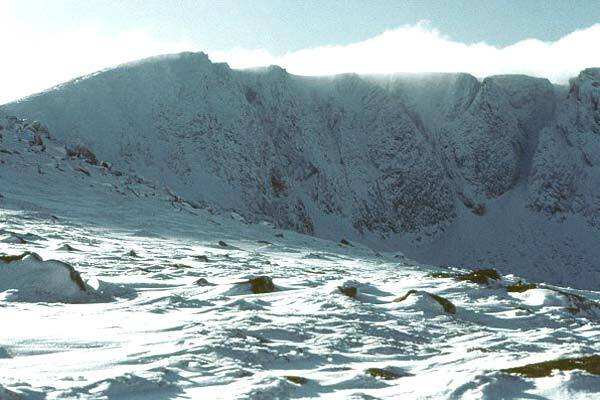 The summit ridge of Lochnagar, showing Cac Carn Mor, taken from the north-west shoulder of Cuidhe Crom in mid-February. 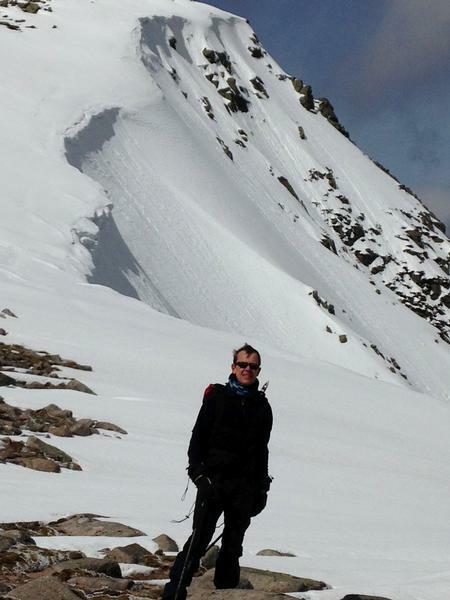 The summary information of one or more ascent routes that include Cac Carn Beag. Jorja checking another summit indicator for accuracy. Or something. June 2015. 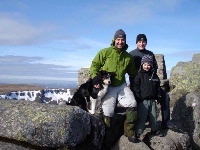 My 6 year old Nephew Jacob's first Munro and also first person to the summit on Easter Sunday 2011. Post a few words about Cac Carn Beag or read what others have had to say. This group of hills can be climbed from the balmoral side. Care is required not to get lost in the balmoral forest but the paths are clearly marked on the map. Climb via the Prince's stone and then directly on to first munro. This does miss out Meikle pap but the Balmoral Forest is superb and fine views are afforded on the ascent. We went on to do Cairn Bannoch and Broad Cairn, before taking in carn t'Sagairt Mor and then descending back to the Balmoral forest. (9.5 hours) It may not be quicker than the circuit of Loch Muick when doing 5 but it is for Lochnagar alone and saves on driving. I climbed all 3 of these in one (roasting hot) day with my 9 year old grandson and 2 border collies, it was a fantastic day out but I must admit a bit far for my grandson in the heat. Once your at high level the going is relatively easy but be aware that the ascent from Carn an Sagairt Mor towards Dubh Loch is difficult going through the boulders and bog, my collies were struggling at times!! 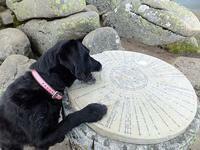 We started from the Spittal of Glenmuick car park, and walked up the Lochnagar Path. We got to the ridge between Cac Carn Mor and the Meikle Pap, and were hit with horizontal hailstones, so we didn't climb the Pap, but once the poor weather passed, we were rewarded with stunning views of the sheer crags of Lochnagar and the lochan itself. We climbed Cac Carn Mor by scrambling up from the ridge that overlooks the lochan and walked to the peak of Lochnagar along the tops of the crags. From the summit, we were able to see for miles around, before the weather started to close in on us. On our way back down, we followed the Glas Allt all the way down to Loch Muick, past the spectacular waterfalls. We walked along the loch's Northern coast, down the East coast, and followed the Loch Muick path back up to the car park. Lochnagar was my first Munro, in 1966 at the tender age of fourteen I climbed to the top with a party from Summerhill School Aberdeen. Something else happened that year that we are never allowed to forget the only difference being I have repeated my feat many times which is more than the other lot have done (HA HA).